Pasi paruppu/ moongdhal payasam is a traditional sweet dish prepared in the southern parts of India. 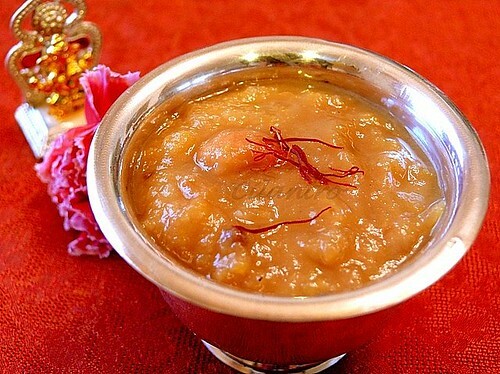 Parippu Pradhaman, Pesara Pappu Payasam are the different names of this payasam in different regions of the south. Cooked moong dal is simmered in coconut milk, melted jaggery and flavored with cardamom powder, toasted cashewnuts and raisins. In the pan, heat a teaspoon of ghee/clarified butter and add the moong dal and roast it for approximately 5 mts to a nice aroma. Remove from pan and pressure cook the dal till soft and mushy approximately 2 whistles. Take a cooking vessel, add jaggery and water and boil till the jaggery melts. Keep aside. In a heavy bottomed vessel, add the cooked mushy dal, jaggery syrup and combine well. Next, add the coconut milk and keep on stirring on low flame till well blended for at least 10 minutes. Turn the heat off. Heat a pan, add a tbsp of ghee and toast the cashewnuts first when they turn to a very light brown color, add the raisins and fry them until they pop up to double their size . Keep aside. In the same pan roast the grated coconut to nice brown color and add to the payasam. Also add the cardamom powder, nutmeg and toasted cashews and raisins. Finally add few strands of saffron. Serve warm or chilled. It tastes good both warm and chilled. I prefer it warm. This sounds so tasty with the coconut and spices, nuts and raisins... wow, I have to bookmark and try this soon! I want to hav ethat payasom, looks so so yumm. Looks super Cilantro. My grandma used to make it often and I was not too fond of it. But now that I don't get it oftens I totally adore this payasam. Super cool an easy and a yummy payas... Love the color and neatly presented!!! Looks rich and delicious ! Payasam looks awesome,and also good clicks.